Sharply directed and superbly acted, this is a hugely entertaining and frequently hilarious sci-fi comedy that stands as a worthy addition to Shaun of the Dead and Hot Fuzz in the so-called Cornetto Trilogy. Co-written and directed by Edgar Wright and starring co-writer Simon Pegg and Nick Frost, The World's End is the third entry in the trio's so-called Cornetto Trilogy after Shaun of the Dead and Hot Fuzz. 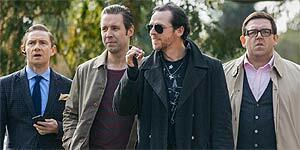 Pegg stars as never-grown-up manchild Gary King, who's become obsessed with an epic pub crawl he failed to complete with his best friends Andy, Ollie, Pete and Steve (Nick Frost, Martin Freeman, Eddie Marsan and Paddy Considine) in their hometown of Newton Haven, twenty years ago. After reuniting his four friends (all of whom, unlike Gary, have grown up and now have families and responsible jobs), Gary persuades them all to join him in recreating their epic 12 pubs, 12 pints pub crawl in Newton Haven. However, after a few pints, they discover that the townspeople are all behaving rather strangely and soon their evening takes a decidedly bizarre turn and the five friends end up fighting for their lives. Pegg is excellent, testing the limits of his usually likeable screen persona by playing Gary as a significantly more obnoxious character than we're used to seeing from him. Frost is equally good as Andy (his sparky chemistry with Pegg is a given) and there's terrific support from Marsan (inspired), Freeman and Considine, while Rosamund Pike more than holds her own as Ollie's sister Sam, who awakens powerful, long-thought-dormant crushes in both Gary and Steve. The lengthy set-up (including a flashback to the men as teenagers) means that the film takes a while to get going, but once the pub crawl begins, Wright keeps things moving at an exciting pace throughout, ensuring that you're never more than a few seconds away from a witty line or an inspired visual gag. In particular, the (notably weaponless) 'Pub Fu' fight sequences are thrillingly directed, often unfolding in a single take with no cuts (look out for a superb sequence where Gary tries to fight without spilling his pint). Wright and Pegg's witty script is packed with quotable lines and is frequently laugh-out-loud funny, but it's also spot-on and surprisingly moving in its depiction of male friendships and manages to say some interesting things about both the gradual homogenisation of British society (there's a great gag involving chain pubs) as well as commenting on both the appeal and the inherent dangers of nostalgia. That said, there's also a fantastic, nostalgia-heavy soundtrack comprised (mostly) of songs released between 1988 and 1991. The World’s End is a hugely entertaining Sci-Fi comedy with a laugh-out-loud funny script and terrific comic performances from a superb cast. Highly recommended.